Anonymous sale; Christie's, London, 4 July 1924, lot 89 (7,800 guineas to Jacques Goudstikker). H.U. 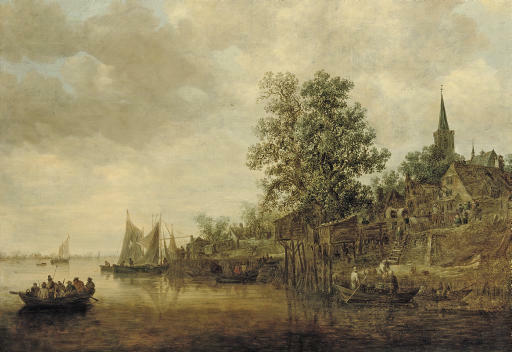 Beck, Jan van Goyen 1596-1656, Amsterdam, 1973, II, p. 235, no. 497, illustrated. C. Wright, Paintings in Dutch Museums. An Index of Oil Paintings in Public Collections in The Netherlands by Artists born before 1870, London, 1980, p. 147. Old Master Paintings: An illustrated summary catalogue, Rijksdienst Beeldende Kunst (The Netherlandish Office for the Fine Arts), The Hague, 1992, p. 108, no. 816, illustrated. The Hague, Schilderkundig Genootschap Pulchri Studio, Catalogue de la Collection Goudstikker d'Amsterdam, November 1924, no. 45, illustrated. Rotterdam, Rotterdamsche Kunstkring, Catalogue de la Collection Goudstikker d'Amsterdam, 20 December 1924-11 January 1925, no. 25. London, Royal Academy, Exhibition of Dutch Art 1450-1900, 4 January-9 Marsh 1929, no. 498. Brussels, Exposition Universelle et Internationale: Cinq siècles d'art, 24 May-13 October 1935, no. 721. The Hague, Bredius Museum, 1959, on loan. In the 1640s van Goyen reached the pinnacle of his creative work. He started to move away from the example of his teacher Esaias van de Velde just before 1630 and developed his characteristic tonal landscapes during the 1630s, mainly under the influence of the Haarlem painters Pieter Molijn and Salomon van Ruysdael. Van Goyen was able to capture an enormous range of atmospheric effects and achieved a masterly sense of depth in his compositions, even though he restricted himself to a limited palette. Different tones of green play an important part in the overall effect of the present composition. Later in the same decade van Goyen started to introduce more colour into his tonal landscapes again. The banks of the river that form a stage for gentlemen stopping at an inn, peasants conversing and boats mooring are all elements that are often encountered in works by van Goyen, for instance River landscape with gentlemen at an inn in the collection of the Schweizerischen Eidgenossenschaft Bern also dated 1643 (H.-U. Beck, op. cit., 1973, II, pp. 233-4, no. 495).